Ability to practice strategiesUsually faster than waiting on each person to take their turnYou don't have to wait for a convenient time to gather enough playersYou can stop in the middle and resume laterThese have been my favorites Le Havre: Played on iPad 2 and iPhone 5. With the changes to iTunes 11, I struggled finding a couple of features. First, the left side-bar was missing. Hide or show the left side-bar by clicking CTRL-s (or CMD-s). 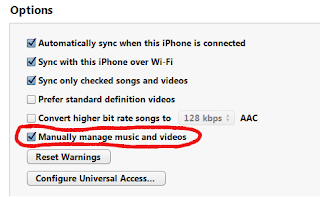 The other thing I struggled with was finding the option to Manually manage music and video. It was quite easy once I found it. The problem was that it was hidden below the fold. Go to your device (iPod, iPhone, or iPad), and click on the Summary section.From the Summary section, scroll down.The option is located just above the Reset Warnings button.Then it's simply checking or unchecking the box and clicking Apply.